On Thursday, January 26th 2017, our project partner Seval Özen, PhD candidate at Freiburg university, gave a guest lecture on the topic “Multi-Word Verb Usage by Turkish Learners of English: A Corpus-based Study”. After the first attention-shift from grammar to lexis seen in 1960s, the attention of the last 15 years or so has turned towards lexical groups, i.e. to multi-word units such as collocations, phrasal verbs, chunks, etc. From the 1980s onwards, the increasing availability of large electronic corpora has made it possible to explore vast amounts of authentic language data both qualitatively and quantitatively without difficulty and uncover the highly patterned nature of language use. Whereas formerly multi-word units were treated as peripheral exceptions and linguistic rarities, a substantial body of research now exists to show that natural language use, both written and spoken, largely consists of recurrent word sequences. Therefore, they have increasingly been regarded as important building blocks for language acquisition and use. In the context of foreign or second language learning, multi-word units constitute a particularly interesting phenomenon since they are known to cause problems for learners. One group of multi-word units that causes great difficulty even for advanced learners of English is multi-word verbs. Their acquisition and active usage is a challenge since they are complex both in terms of their grammatical form and their lexical meaning. 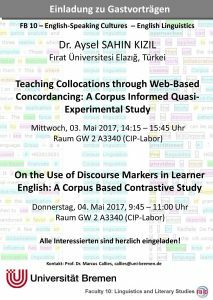 In this talk, an on-going dissertation project on the use of multi-word verbs by Turkish learners of English will be presented. The focus will be on one sub-group of multi-word verbs investigated in the Turkish sub-corpus of the International Corpus of Learner English (ICLE) – namely phrasal verbs. 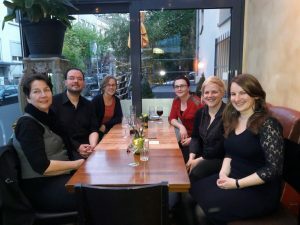 Congratulations to three team members who were awared doctoral research scholarships by the University of Bremen in the context of the BremenIDEA out funding initiative. Doctoral researchers of the University of Bremen can receive funding for stays up to 3 months at international research institutions. In January 2016, Ekaterina Zaytseva spent a full month in Louvain-La-Neuve/Belgium working with Dr. Magali Paquot at the Centre for English Corpus Linguistics. In October 2016, Alexandra Kinne will spend a full month in Granada/Spain working on her PhD dissertation with Dr. Cristobal Lozano at the University of Granada. From October to December 2016, Leonie Wiemeyer will spend three months at Boise in Idaho/USA working on her PhD project with Prof. Casey Keck at Boise State University.